How To Get There: Take the right fork road out of Winfield, past the Winfield Cemetery. The road is marked "high clearance vehicles only", but this is a very easy four wheel drive road. An obvious, but unmarked turnoff to the left at about .2 miles past the cemetery leads to a gate at the base of Winfield Peak. Hike up the old road to the mine about 6 miles. Difficulty: The four wheel drive is very easy, although in spring the north fork of Clear Creek can run higher than normal and four wheel drive vehicles may encounter deep water in spots. 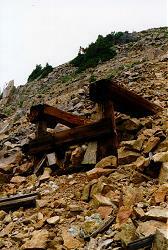 A network of jeep roads can be followed to the top of the eastern shoulder of Winfield Peak above the mine. It is a steep climb and some brush and debris may require small detours. 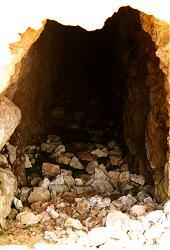 Actual access to the mine is treacherous. History of The Fortune Mine: Renamed later the R.E. 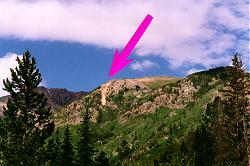 Lee, the Fortune Mine shipped for a number of years and by the 1880's a tramway of 2,600 feet in length had been built. In 1902 it was owned by Dr. Hale of West Virginia and Mr. Sol Hopkins of Greeley, Colorado. This mine was one of the top producers in the La Plate Mining District and the scar from it's tailings can be seen all the way up County Road 390. The wheel from the top of the tram was moved in the 1970's for historical preservation to the Vicksburg museum where it can be seen today.